Today I am posting one of my favourite dish, Aloo Palak. This is yet another traditional Punjabi delicacy filled with flavors and packed with nutrition. There are different ways to prepare it. I usually follow the same recipe of Palak Paneer, where I substitute paneer cubes with boiled potato cubes. 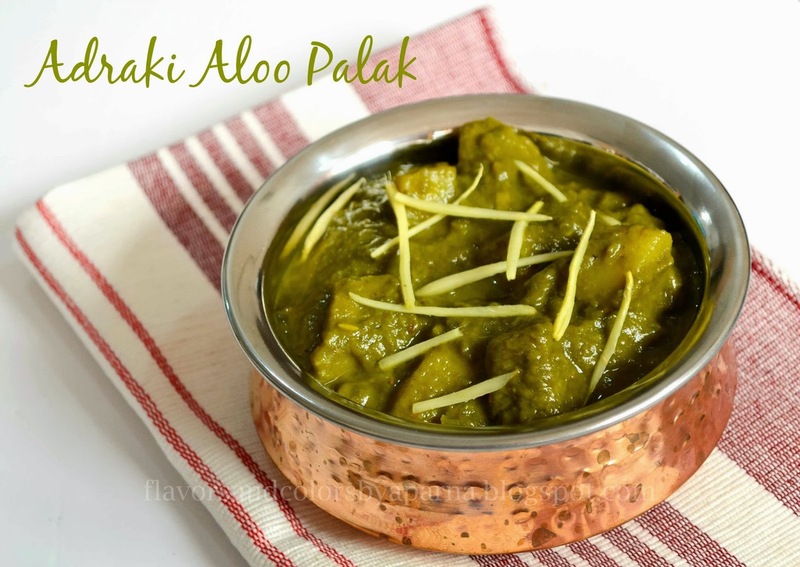 But when I came across the recipe of aloo palak here, I liked that extra unique adraki flavor given to the dish. With generous amounts of ginger infusing its flavor into this dish, it was a perfect accompaniment to rotis especially at the time when the weather was chilly outside. Wash, rinse spinach in running water. Remove the thick portion of the stem. [You can follow any method to clean it but make sure to clean it well from all dirt]. Roughly chop the leaves. Blanch it in hot water with sugar. Now drain and put the leaves in a bowl containing ice cold water [adding sugar and ice cold water helps to retain the green color]. Heat oil in a deep pan. Add sliced onions, chopped ginger pieces and fry it for a minute. Drop chopped tomatoes in the pan and saute it until the tomatoes turn soft . Switch off the flame and allow the mixture to cool. Transfer the mixture to mixer vessel and blend it with blanched palak, chopped green chilli to a smooth paste. Note: I have not added garlic in here, if you want you can add a tsp of finely chopped garlic or its paste before grinding the palak into paste. I was not able to retain the green color here as I had blanched palak on previous night and cooked this side dish next day.